The Nakajima Ki-44 Shōki (鍾馗) ("Demon Queller") was a single-engine fighter aircraft used by the Imperial Japanese Army Air Force in World War II, first flying in August 1940 and entering service in 1942. 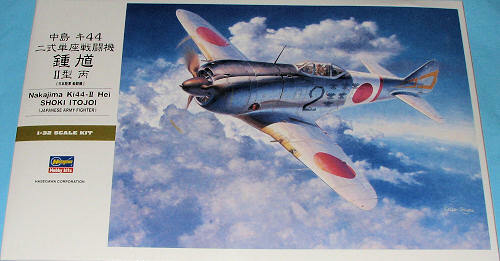 The Allied codename was "Tojo"; the Japanese Army designation was "Type 2 Single-Seat Fighter" (二式単座戦闘機). In contrast to its predecessor, the nimble Ki-43, the Ki-44 was designed for speed and climbing ability and was used to intercept high-flying B-29 Superfortress bombers. With its poor visibility on the ground, weak armament, and high landing speed, it was generally disliked by pilots. The unit later became the 47th Sentai, when flying home defense in Japan. More aircraft were later sent to China, and others were used in defense of oil wells in Sumatra, Indonesia, the China-Burma-India theater of operations, Philippines, Japanese metropolitan defense, mainly concentrated around Japan's large industrial cities and even kamikaze operations in the last stages of the war. The 2c version "Tojos", armed with heavy cannon, were used against B-29s by one special kamikaze unit (a company of four aircraft minimum) of the 47th Sentai, which specialized in bomber collision tactics, the Shinten unit ("Shinten Seiku Tai"(Sky Shadow) 47th Sentai (Air Regiment) based at Narimasu airfield), during the defense of Tokyo. The Nakajima Ki-44 at one point equipped 12 sentais of the Japanese Army Air Force (the 9th, 22nd, 23rd, 29th, 47th, 59th, 64th, 70th, 85th, 87th, 104th and 246th Air Regiments) which saw action before their (partial) replacement with Ki-84 Hayates for the final battles of the war. The Manchoukouan Air force also received some examples of these aircraft during wartime. After World War II, the Nationalist Chinese 18th Squadron of the 12th Fighter Group was equipped with Ki-44s formerly of the 9th Sentai, which had disbanded in Nanking, and of the 29th Sentai, which had disbanded at Formosa and they participated in the Chinese Civil War. The People's Liberation Army Air Force managed to get hold of aircraft formerly belonging to 22nd and 85th Sentai, who had disbanded in Chosen, the Japanese name for Korea during their imperial rule (1910-1945) over that country. These aircraft were flown by Japanese nationalist pilots, who used them until the last two Ki-44s finally retired in the early 1950s. Moving along in their kitting of JAAF fighters in 1/32 scale, it was only a matter of time before Hasegawa chose the Ki-44. If you see a pattern here, it is that they are super-sizing their 1/48 kits to some extent, what with the recent spate of P-40s and other kits making it into the giant leagues. You'd expect this kit to be state of the art and you'd be correct. The first thing that caught my eye is that Hasegawa provides a pilot for this aircraft. You get two heads, one with and one without an oxygen mask. These planes were high altitude interceptors so this would be normal equipment. The kit has a very well done cockpit and though I'm sure you can get a bit more detail from a resin replacement, for most modelers, this is more than adequate. One has a choice of detailing the raised instruments or using a decal. I noticed that there are color options for the instrument panel, either a green or matte black. This is also true of the wheel wells and inner gear doors. Some modifications in terms of removing some attachment points or opening holes is required for this variant in terms of weapons, drop tanks or adding the fuel cooler. The model can also be built with the flaps up and closed, a more normal position when on the ground. Again, some modification of the parts is needed to do this. The rest of the kit has big parts and good detail. 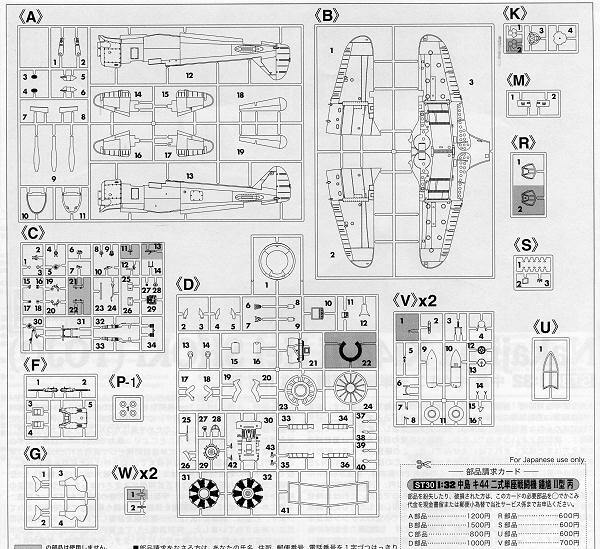 Instructions are usual Hasegawa standards with well drawn construction sequences, the usual notes where needed to do modifications and Gunze paint references. All three markings options are unpainted metal with green-grey fabric control surfaces and black anti-glare panels. 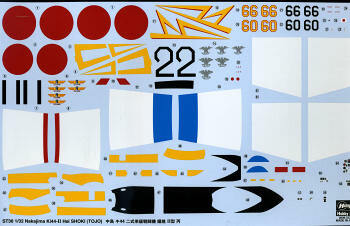 These panels and the wind yellow ID bands are provided as decals, though you may wish to paint them in place. Markings are for two 'aces' of the 70th Sentai. One in the box art plane of W.O. Makoto Ogawa while the other is a similarly marked plane of Capt. Yoshio Yoshida. The third option is for Capt. Teiichi Hatano of the 47th Sentai. This and the first option have white 'Bandages' around the wing and fuselage. Again, these are provided as decals, though one may wish to paint these in place. The colorful decal sheet is superbly printed and being a 'new era' sheet should work as well as any aftermarket version. So here is the next fine large scale kit from Hasegawa. It builds into a super replica and is one that, thanks to Hasegawa's fine engineering, should be done rather quickly. September 2009Thanks to www.dragonmodelsusa.com for the preview kit. Get yours today at your local shop or on-line retailer.